We hope our readers are going through all the three articles related to Current Affairs on a daily basis. So once again in this Current Affairs Updates for 28th March 2018 we have brought to you the Latest and Important News Headlines with the proper amount of explanation given against each topics. Some of the important headlines of today include the introduction or Real Time Payment System by SWIFT, INS Tarkash, launch of E-Tribes India, MOU by AAI and Assam Govt. All the important news are given below and have been framed keeping the SSC and Bank Exam Pattern in mind. There is absolutely no need to read any other Current Affairs other than this as we cover most of the headlines which are important for IBPS PO, IBPS CLERK, SSC CGL, SSC CHSL and Railway. 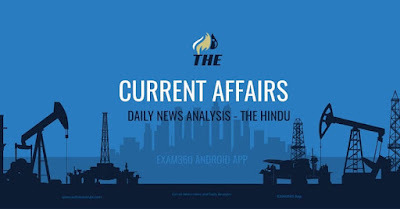 You may also like our Daily Current Affairs Quiz and One Liner Static GK and Note Down Points on a regular basis. The Principal Scientific Advisor (PSA), a post created by the Atal Bihari Vajpayee government in 1999, is the topmost advisor to the government on all matters related to scientific policy. India, the largest consumer of mobile data in the world, ranks 109th when it comes to mobile Internet download speeds. Norway tops the list. The average download speed over the mobile increased to 9.01 mbps in February from the 8.80 mbps in November last year, but the country's rank continued to stay at 109th, Ookla's Speedtest index said. Ministry of Housing & Urban Affairs has approved the construction of 3,21,567 more affordable houses for the benefit of urban poor under Pradhan Mantri Awas Yojana (Urban) with an investment of Rs. 18,203 cr with central assistance of Rs. 4,752 cr. SWIFT has announced that it is extending its gpi Tracker to cover all payment instructions sent across the network. This will enable gpi banks to track all their SWIFT payment instructions at all times, and give them full visibility over all their payment activity. The beginning of the tourism season in the Kashmir Valley was today marked with the opening of Asia's largest Tulip garden here on the banks of the iconic Dal lake. Jammu and Kashmir Tourism minister Tasaduq Mufti and Floriculture minister Javed Mustafa Mir were among the first visitors for this season. The top court directed the central government to consult the Oil Marketing Companies(OMCs) and get their reply on this proposal. The initiative forms a part of Jet Airways’ strategy to further strengthen its domestic footprint of 45 cities in the country, complementing its three hubs at Mumbai, Delhi and Bengaluru. The guarantee fee for the amount has also been waived by Ministry, said a release. The decision will ease the flow of borrowed funds for Ministry of Railways to undertake projects. Indian Navy’s Talwar class frigate INS Tarkash carried out a “greeting and training” exercise on Sunday with the U.S. Navy’s Theodore Roosevelt Carrier Strike Group (TRCSG) which was until now involved in operations against the Islamic State in the Arabian Gulf. INS Tarkash sailed in formation with aircraft carrier USS Theodore Roosevelt, guided-missile destroyer USS Preble (DDG 88) and other ships on March 25 as part of the exercise, the U.S. Embassy said here in a statement. India is getting ready to host the 8th 3R Regional Forum in Asia and the Pacific in its cleanest city, Indore* from 9-12 April, 2018 co-organised by the Ministry of Housing and Urban Affairs (MoHUA) Government of India, the Ministry of the Environment, Government of Japan (MOEJ), and the United Nations Centre for Regional Development (UNCRD), under the theme of "Achieving Clean Water, Clean Land and Clean Air through 3R and Resource Efficiency- A 21st Century Vision for Asia-Pacific Communities". India’s rapid urbanization and burgeoning population have greatly increased the challenges of solid waste management in the country. Urban India produces an estimated 54.75 million tonnes of municipal solid waste annually. The Forum comes at an opportune time with the Indian government’s focus on scientific management of 100% municipal solid waste through its ambitious Swachh Bharat Mission (Urban). While inaugurating the State level programme of ‘Mission Sambhav’, an initiative for building 1 lakh sanitary toilets throughout Assam in a time bound manner, Chief Minister Sonowal made this call and appreciated the people of the state for their participation in making the Swacch Bharat Abhiyan (SBM) successful in Assam. OPIC's loan to WaterHealth India Pvt. Ltd, a subsidiary of WaterHealth International Inc. of Irvine, California, will help finance the installation of as many as 900 decentralized plants that purify water on site and sell it at a price that is three to four times lower than bottled water alternatives currently available in the marketplace. The United Nations General Assembly declared to observe 21st March as World Down Syndrome Day (WDSD) and since then every year, this day is officially observed by UN to create awareness about people with Down Syndrome. Speaking on the occasion, the Minister for Coordination in the High Commission, A S Rajan said that the SACF has been doing commendable work for nearly two decades to promote Hindi and regional Indian cinema in the UK and as a result has served the cause of dissemination of the Hindi language.